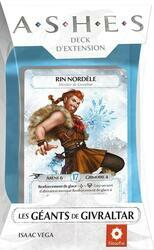 In this new expansion for Ashes, meet Rin Nordèle, a jovial Heir whose enthusiasm for life and battle warms the frigidity of his native land. Rin rebukes the overly complex magic, preferring to turn to spells and monsters as robust and imposing as his personality. A new Heir and his prebuilt deck. 10 new spells and 3 new conjurations. 1 new type of card: the alteration spells invoked.